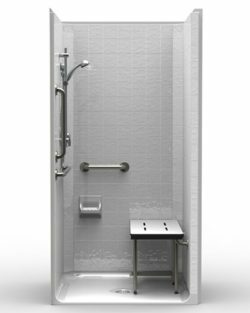 The team here at ORCA HealthCare are delighted to introduce an innovative new barrier coat technology into our handicap shower stall collection. 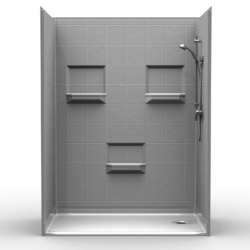 This revolutionary blue barrier coat has been specially developed for use in bathrooms. While the traditional green barrier coating worked well, it was actually originally intended to be used in a marine environment—on boats, not showers. The new blue coating not only looks more attractive and luxurious, but it also sits flatter once it’s cured, meaning you get a smoother wall finish. The new formulation also produces fewer emissions than the traditional barrier coat—great news for the environment. 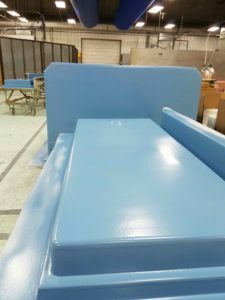 The new blue coat adds strength and durability to the gelcoat layer, and ensures a consistent product surface. 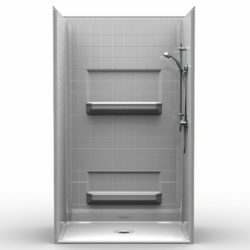 It also enhances the appearance of the product, and eliminates print through, meaning the fiberglass strands will not be visible on the surface of the step in shower wall. 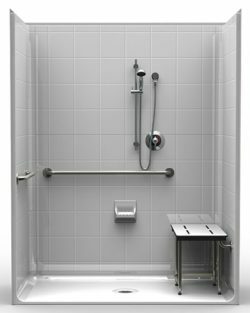 You can be one of the first people to experience this innovative new barrier product when you purchase a handicap accessible shower from ORCA HealthCare. 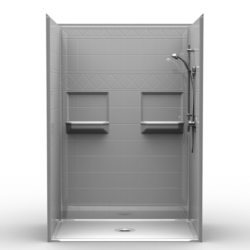 All the units in our accessible shower stall line have undergone rigorous testing and quality control processes to ensure they are of the high standard our customers expect and deserve.